PAW Patrol continues to be one of Nick Jr.'s most unstoppable franchises; the fifth season just premiered last month and merchandise is still selling like hotcakes. The most recent...*ahem*...wave of merchandise includes "Sea Patrol", in which our bold and fearless pups take to the water and...well, basically do the same thing as always, except now you have to buy more toys. 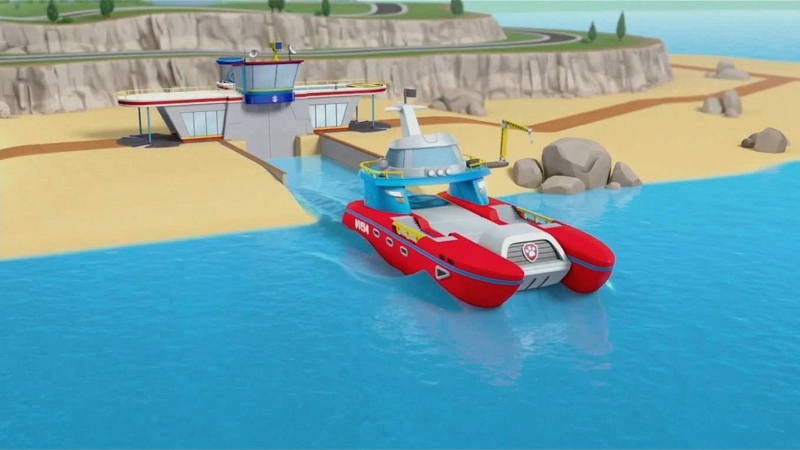 The aptly-named Sea Patrol is the eleventh themed collection of PAW Patrol episodes on disc, and follows suit by offering six underwater adventures that typically go like this: the PAW Patrol canines (klutzy firefighter Marshall, aquatic expert Zuma, construction oaf Rubble, police officer Chase, recycling guru Rocky, and high-flying Skye) kill time until a citizen yelps for help, while ten-year old handler Ryder waits back at high-tech HQ to break down the potential disaster before sending his team out to rescue them on the Sea Patroller. In recent years, two new pups (helpful husky Everest and super-sniffing Tracker) have been introduced, and both are featured here as well. Unfortunately, PAW Patrol has been given the short end of the chew toy on DVD during the past few years. The good news is that, like past volumes, the episodes included here look and sound great with crisp, 16x9 widescreen transfers and 5.1 audio...so the real advantage here is that they offer a modest step up in quality over most streaming or cable versions, assuming kids will notice or care. Unlike past volumes, all six episodes on this one-disc collection ("Pups Save a Baby Octopus" [double-length], "Pups Save a Shark", "Pups Save The Pier", "Pirate Pups to the Rescue", "Pups Save a Frozen Flounder", and "Pups Save a Narwhal") are less than six months old and presented in chronological order -- they're not serialized, but it's nice to know someone's paying attention over there. Even so, PAW Patrol is long overdue for a proper season-by-season release on DVD or Blu-ray: there's still a lot unaccounted for and it's silly to shell out $10 or more for 90 minutes of content every few months, but this at least marks a half-step in the right direction. Adult quibbles aside, kids are still bound to love Sea Patrol unless they've seen and memorized at least half of these episodes in recent months. This is enjoyable, lighthearted stuff that I'd have flipped for during my single-digit years, and I'm still more than willing to sit through certain episodes multiple times if it keeps the little one happy. As usual, Paramount serves up a decent DVD presentation: skimpy on material, sure (and with no extras, either), but with a great A/V presentation that highlights the series' smooth, colorful animation and action-packed audio. 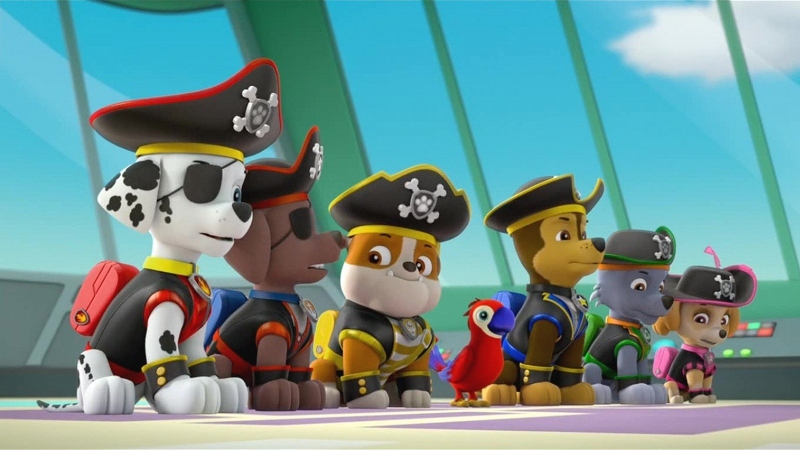 Since PAW Patrol was created in HD from the start, it's no surprise that Sea Patrol looks great on DVD with bright colors, strong detail, and a pleasing amount of texture on the characters and backgrounds. All six episodes are presented in their original 1.78:1 aspect ratios, which showcase PAW Patrol's pleasing visual design and compositions. The stylized color schemes are vivid with no obvious bleeding, while shadow detail and black levels are consistent from start to finish. Small amounts of banding can be seen along the way (especially underwater), but that's expected for the format and possibly a source material issue. Overall, it's another great-looking disc that obviously beats broadcast versions. The audio is presented in Dolby Digital 5.1 and sounds great. Dialogue is crisp without fighting for attention, while a modest amount of channel separation gives songs and action sequences a decent amount of punch. My only complaint is that the volume levels are a little high, particularly during the theme song; music-savvy parents might agree that the term "brickwalled" applies here. But it's doubtful that this problem is exclusive to the DVD, so I blame whoever mixed it to begin with. No English subtitles or Closed Captions are included, although optional Spanish dubs are offered during all six episodes if you need them (or want to hear an even more awesome version of the theme song). Sea Patrol is a one-disc release and comes in an eco-friendly blue keepcase with a matching slipcover. The colorful menus offer smooth and simple navigation. No extras are included, but that's hardly surprising at this point. 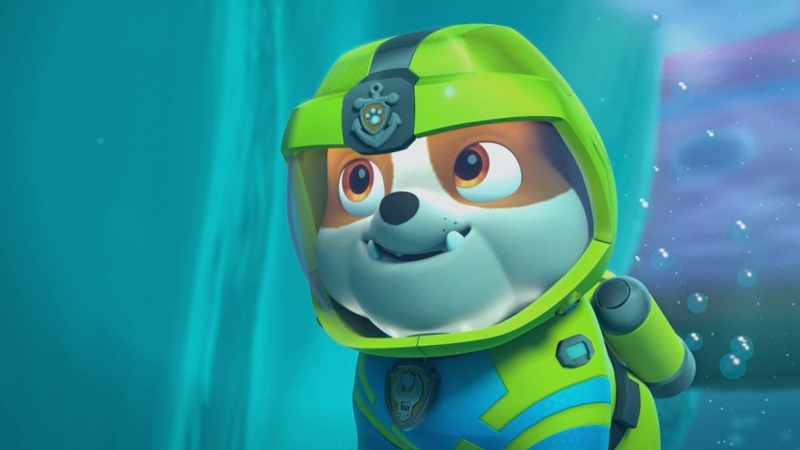 PAW Patrol is still going strong after more than four years (a lifetime, as far as kids shows go), and that's a good thing because it's been a consistently fun and entertaining show: colorful and action-packed with great characters, this series is more enjoyable than its simple, unchanging formula implies. Paramount's treatment of PAW Patrol on DVD is getting a little better (not only are all six episodes themed perfectly, but they're in chronological order and all less than six months old), but there's still room for improvement. Here's hoping we get a proper season-by-season release soon. Until then, Sea Patrol still comes mildly Recommended to young fans who haven't memorized these episodes yet.